THE ULTIMATE THEATRICAL TRIBUTE TO ROCK'S BIGGEST STARS! It’s the classic rock music you love … and you can’t get enough of it. Are these rock icons the real thing or is this Snake Oil? This is not a tribute band! Snake Oil's musical cast not only look like the rock stars they portray, but they use their own natural voices to perfectly impersonate the singing and speaking voices and stage mannerisms of these rock icons. 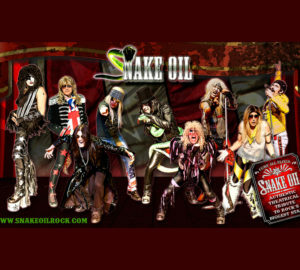 Snake Oil's live theatrical shows are known for their impeccable authenticity to the original artists' recordings, with spectacular costumes, hilarious audience interaction and an array of incredible special effects.